GMO Inquiry 2015’s fourth report investigates the impacts of genetically modified crops on farmers in Canada over the past twenty years. 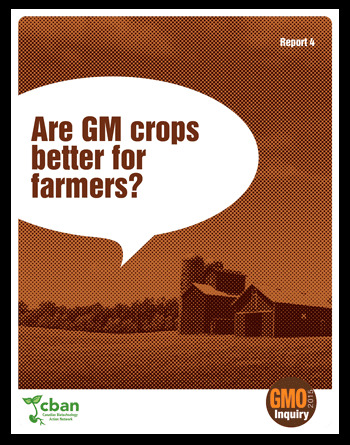 Have GM crops benefited farmers? Have they increased yields and farm incomes? And what are the costs of herbicide-resistant weeds and GM contamination for farmers? What are the costs of herbicide-resistant weeds? Who profits from the use of GM products? Do farmers make more money when they grow GM crops? Is there any increase in yield for GM crops over non-GM crops? How does the actual cost of growing GM crops compare to non-GM crops?